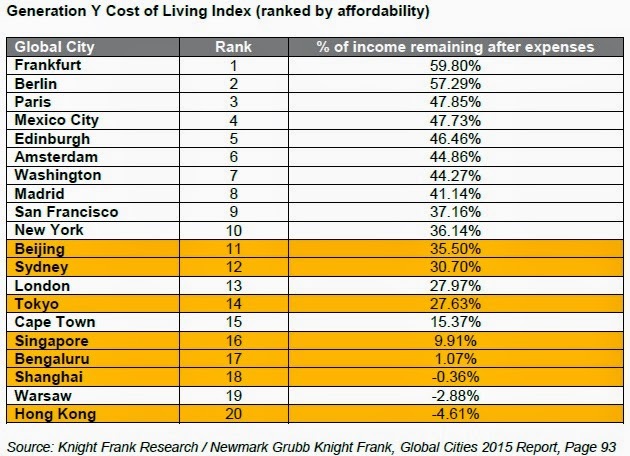 Singapore is one of the least affordable cities in the world for young professionals, according to Knight Frank’s Cost of Living Index. The city-state was ranked 16th on the list of 20 global cities monitored by Knight Frank, and published in its inaugural Global Cities 2015 report. The report stated that young graduates based in Singapore have one of the lowest levels of disposable income, with around 10 percent of their net salaries left at the end of every month. Frankfurt was rated as most affordable on the list, with young professionals in the German city having 60 percent of their income remaining after expenses. In 20th place, Hong Kong emerged as the least affordable city, with a 4.61 percent income deficit recorded for a Hong Kong graduate. 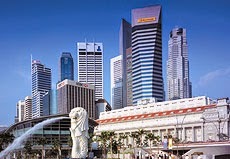 All Asian cities fell below the top 10 among the global cities tracked. Knight Frank’s research looked at young graduates in the districts surrounding the city limits, using variables including graduate starting salary, cost of rented accommodation and utility bills, as well as the cost of a pint of beer, a coffee and groceries. This article first appeared on Property Guru Singapore on 24 September 2014. It is reproduced with permission.